Batman v Superman Character Returning for Aquaman? Exclusive: Is This Batman v Superman Character Headed to Aquaman? Did you catch Patrick Wilson‘s Batman v Superman character cameo on the big screen this weekend? While you don’t actually see the Watchmen star in the Zack Snyder-helmed blockbuster, Wilson lends his voice to an important DC Universe character: the President of the United States of America. What’s more, SHH has learned that we’re likely to be seeing more of Wilson’s President down the road. 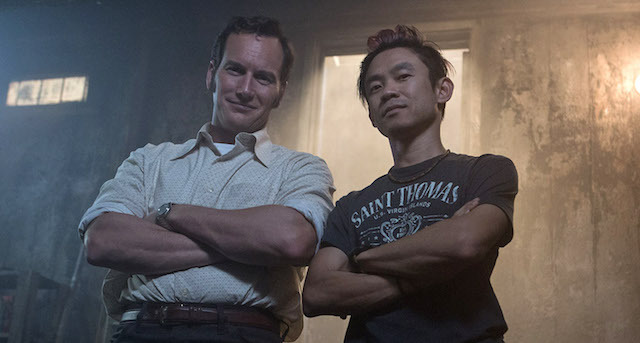 After all, director James Wan has worked with Wilson on films like The Conjuring, Insidious and the upcoming The Conjuring 2. Are we going to see Wilson return for Wan’s upcoming Aquaman? “You just might!” Wan told CS when we asked him exactly that at this weekend’s WonderCon in Downtown Los Angeles. Aquaman is set to star Jason Momoa, who made a brief debut as the title character in Batman v Superman, and will follow upcoming DC Cinematic Universe entries Suicide Squad, Wonder Woman, Justice League Part One and The Flash. Of course, Wan is no stranger to complex continuities having directed films in both the Saw and The Fast and the Furious franchises, but we also asked him about the challenges of building onto a growing cinematic continuity. Aquaman, set for release July 27, 2018, will also star Amber Heard as Mera. Check back for further casting updates as they become available. We also spoke with Wan about The Conjuring 2 and about Lights Out, a new original horror tale that he’s producing. Check back with ComingSoon.net shortly for the full report! How do you feel about the potential return of Patrick Wilson’s Batman v Superman character? Let us know in the comments below!